Why Are Nigerians Talking About #Falz New Album? Music rapper, Jude Abagapopularly known as MI, has called for the protection of fellow rapper, Folarin Falana, popularly known as Falz, following the recent satirical creative of Falz the bad guy, which he entitled 'Talk'. 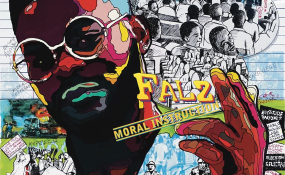 Falz's latest single has drawn nationwide attention and many already feel he might be targeted by politicians, as it addressed societal issues in the wake of the forthcoming 2019 general elections. MI in a twitter post a wrote, "Falz needs to be protected at all cost. Falz needs to be protected at all, at all, and all cost people!"